Nowadays, there are over hundred thousands of resources available on the internet. Instead of spending time on researching for the ones you need, we pick the top quality and the best ones for you, so that you can concentrate on your web development. 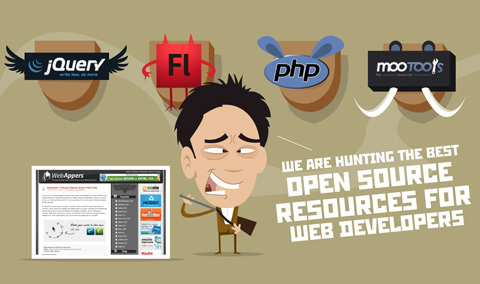 All of the open source resources are categorized into different type of licenses, Creative Commons, BSD, GPL, LGPL, MIT and License Free, so that you can easily pick the most suitable resources for your projects according to the nature of your projects. The creator of WebAppers is Ray Cheung, a web developer and designer who has a passion on web design and web application development. He runs several successful blogs over the internet, aims to share all of the useful information and resources he found to his readers. We are welcome to any suggestion and contribution. Please feel free to contact us if you have found something you would like to share with others. Thank you for supporting WebAppers. Awesome redesign of one of my favorite sites! Great Job. Just a comment to say, realy good job! I like many of your articles.